There was a performance and reception to celebrate the 1st publication of John Duke's Four Chinese Love Lyrics, on Friday, November 5, 2010, at 5:00 pm on Sweeney Concert Hall stage, Sage Hall, Smith College. Karen Smith-Emerson, Elsie Irwin Sweeney Professor of Music, with Clifton J. Noble, Jr., at the keyboard. The Werner Josten Library presents an exhibit of John Duke's in-print American art song publications and a multi-media slide show of ca. 60+ images representing first and later edition cover pages, manuscripts, photos, and recordings. Materials and images used in this exhibit reflect the holdings of the Smith College Archives (The John Duke papers), and the Werner Josten Library of the Performing Arts. Dominique Labelle, soprano, and Yehudi Wyner, piano, performed a concert including songs by John Duke: February Twilight, The Bird, hist...whist, Dirge, and i can't be talkin' of love. This concert was part of the year long celebration, Marking a Century: Music at Smith, 1909-2009. 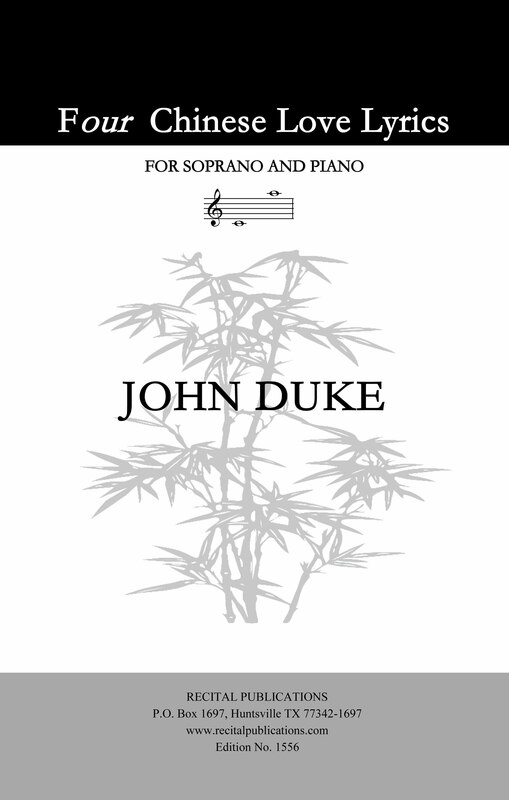 October 15, 2010 --- The Smith College Archives is pleased to announce the first publication of John Duke's Four Chinese Love Lyrics, for soprano and piano (Ed. No. 1556), by Recital Publications (Huntsville, TX). These are the first "new" Duke songs to be published since 2001. They are available directly from Recital Publications, or through your local vendor. Two other Duke song sets are published by Recital Publications: Eight songs on translations from the Greek and Latin lyric poets, for baritone and piano (Ed. No. 99); and Five Lewis Carroll poems, for medium voice and piano (Ed. No. 100). ISBN: 978-1-4507-3444-8 -- $15.00 -- Ed. No. 1556. Preface by Marlene M. Wong; printed edition transcribed and edited by Clifton J. Noble, Jr., from the manuscript transparency and with consultation of the dated sketches, working copy, and a recording made with the composer at the keyboard. 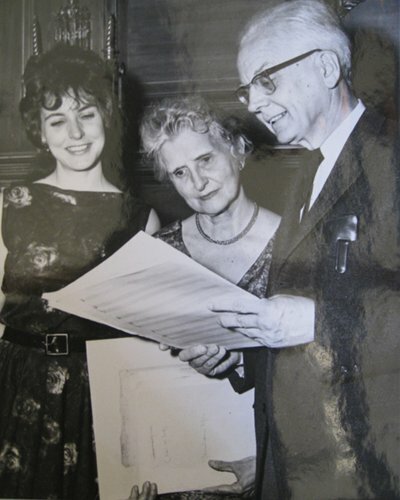 Walter Foster, publisher (Recital Publications) has made a gift of letters written to him by John Duke between March 19, 1979 and September 30, 1984. Duke's last letter is accompanied by a handwritten "select list of singers and teachers all of whom would be interested in my songs." The group also includes a letter, dated November 13, 1984, from Karen Duke Sturges informing Foster of Duke's death on October 26, 1984. Donald Boothman, baritone and long time Duke collaborator, has made available copies of letters written to him between September 2, 1973 and March 30, 1983. These letters document their musical collaboration and friendship, including the evolution of their joint recording project.